As an amateur wannabe artist, I’m always looking to improve my skill with the paintbrush. I obsess over my artistic friends’ paintings, stare at it long enough and steal techniques. I watch videos on YouTube to try and emulate the artists. However, I’m often lazy to pull out the messy paints and try out the techniques. So, I’m usually just watching people draw/paint and wondering if I can get into the artist’s head and figure out how they do what they do. The answer to my woes came in the form of Odosketch, on which I have now spent hours and hours watching blank canvas transform into beautiful drawings, stroke by stroke. 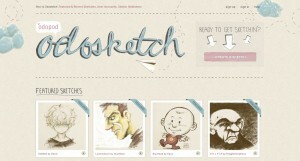 Odosketch has a very artistic look and a call-to-action “create a sketch” button that makes you want to try it out. I did, and I was very impressed. You are presented with a blank moleskin-textured canvas with an artists’ toolbar that includes different brushes of various colors and thicknesses. Given the simple and user-friendly interface, it only takes an initial scribbling on the canvas to figure out the brushes and strokes. While you don’t need a user account to create or view replays of sketches, you do need one to save your sketches. Play around, get comfortable and create amazing art work, and if you manage to impress the staff at Odosketch, they will feature it on their homepage under “Featured Sketches”. What I personally love about Odosketch is the replay feature that allows you to click on any sketch and watch the amazing transformation of canvas into art. It allows you to follow every deliberate and accidental stroke of the brush (at a very high speed) and serves as a great learning tool for amateurs. 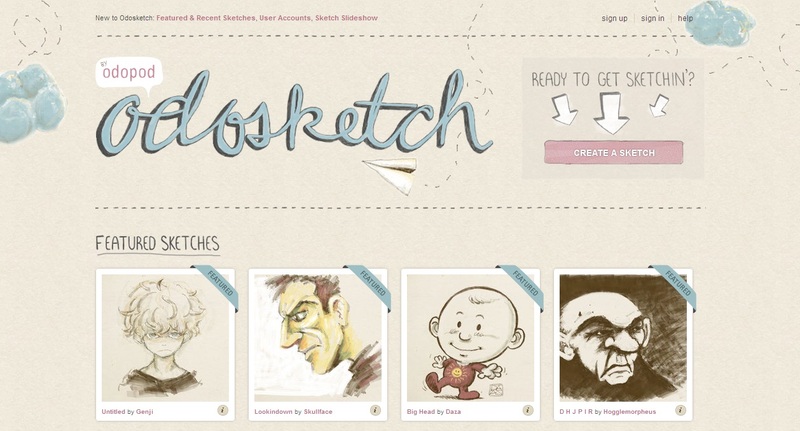 One of the original features of Odosketch allowed users to “clone” sketches by other users. That’s right – users were able to build on the works of others, while retaining credits to the original creator of the work, thereby promoting a very open and Creative Commons style of content-sharing. However, after a few cases of people passing off others’ works as their own without adding to or modifying it, Odosketch has temporarily suspended the cloning feature. At this point, you can only clone your own sketches. According to the Facebook page of Odosketch, the team is figuring out innovative ways to manage collaboration and cloning in the future. I, along with their fan base on Flickr and Facebook, look forward to it. Aspiring artists, I would encourage you to play around with Odosketch, without the messy paints and expensive canvas; watch and learn from the community of experts and amateurs alike, emulate and pick up new techniques, and hone your skills. I’m curious to see if the techniques picked up on Odosketch will transfer back to paper-sketchbooks. In any case, practice your skills over and over without the guilt of wasting paper and have fun. For the past week that I’ve discovered Odosketch, I have had tons of fun playing around with it and I am sure you will too.